I’ve been on a canning adventure this summer… we joined an awesome farm share, but it’s WAY too much food for two people to eat. Sooo… the weekend habit is now preserving the bounty for winter eating and gifting. And now I’ll can anything! At the local market Saturday morning, I spotted jars of homemade red wine jelly for sale, my first thought was Cupcake Red Velvet would be perfect for this. 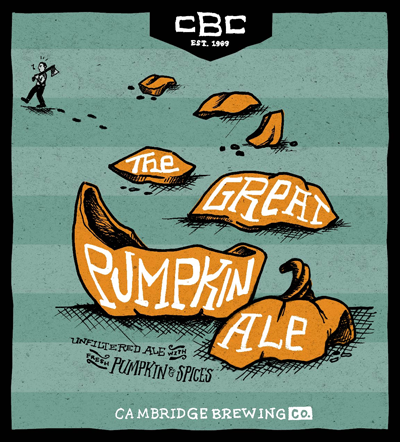 But back to beer… Cambridge Brewing Company’s Great Pumpkin Ale was on display, so I bought a stash of one of my favorite fall brews. Once the week’s veg supply was dealt with (I made a ton of piccalilly), I got the idea to make beer jelly! It was quick and easy, adapting a standard juice-based recipe. Give it a whirl, and let me know how it goes. This recipe should make 7 or 8 half-pint jars. You can adjust the “molasses-y” flavor by adjusting the ratio of white to brown sugar. Baking tip: the sugars are interchangeable. Clean and prepare canning jars and bring canner (or stockpot) water (enough to submerge the filled jars) to a boil. Bring the ale to a boil in a medium saucepot. Reduce to medium low heat and slowly add sugar until it has all fully dissolved. Add pectin and bring mixture back to a simmer and cook 3-5 minutes, or to about 220° on a candy thermometer. Remove from heat and mix in the lemon juice. Pour jelly mixture into sterilized and warm canning jars, leaving ¼ to ½ inch space at the top. Wipe the tops clean and place lids and twist bands on finger-tight. Lightly boil the filled jars for 10 minutes, then carefully remove to cool before fully tightening the bands. Let your jelly set before enjoying with water crackers or a sharp cheddar! I’m a Tau Beta Sigma sister!